IN THE GEOGRAPHICAL CENTER OF ANDALUSIA, at less than one hour of Cordova, Jaen, Grandada, Malaga. 75 minutes And to Seville two hours. Placed in NATURE RESERVE OF THE SUBANDALUSIAN ONE, in a cultural and gastronomic environment. THE GREEN ROUTE, which it(he,she) they separates to 100 meters, to walk and to walk in bicycle. Fabulous puttings of the Sun and skies muyazules and clear.. Ecological Garden, to taste the products of season. Track of game. A very relaxing, calm place, placed good and communicated good. The Cortijillo packs his(her,your) own(proper) virgin olive oil extra Ecoligico. of recognized prestige, and practises the AGRICULTURE exterior(foreign) very wide ECOLOGICA.Zona in full field, and conference cleared, in a sea of olive trees. Warm welcome from Balbino and his wife. Balbino was there to help us if we needed anything. We visited this property because we wanted a convenient location in Andalusia between Cordoba and Granada. Three nights was all we had allocated for this particular rental. I have regretted that decision ever since. I wish now we had stayed much longer! Our two bedroom apartment was comfortable and appropriately equipped, and the view from our private terrace of the olive groves and castle of Luque was beautiful. The grounds of the Casa Rural were immaculately groomed, with rustic artful touches everywhere. The gorgeous pool was inviting. But best of all, was the extraordinary warm hospitality we received from Balbino and Carmen, who made our stay special. From the moment we arrived our hosts made us feel welcome - Balbino presented us with fresh veggies from his poolside garden and olive oil from his grove of trees, Carmen prepared a special romantic dinner for us under the stars on our last night - we left the next day feeling as though we were saying goodbye to old friends. Five stars are not enough to express our enthusiasm for this particular Homeaway. 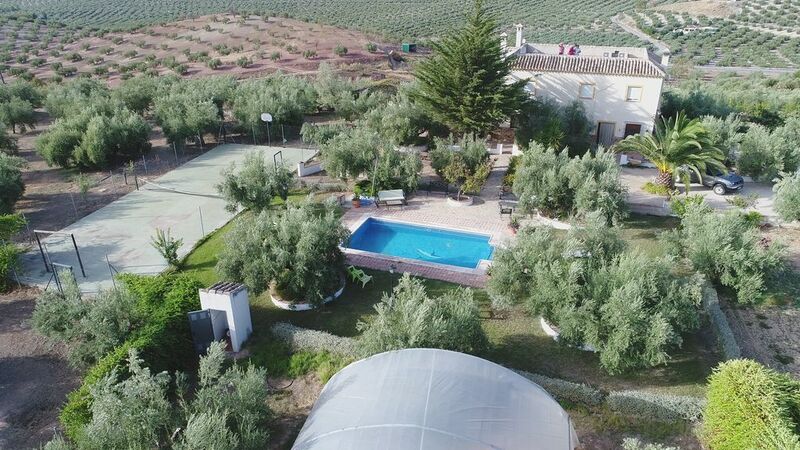 A visit to this property is worth far more than a place to sleep - make sure you allow enough time to truly enjoy the special environment these two have created in the middle of the olive groves of Andalusia. Os agradecemos mucho vuesrta estancia en Agroturismo Eclogico El Cortijillo. Ha sido una satisfacion poder compartir con vosotros unos momentos tan agradables . Las verduras del jardin y aceite ecologico.son para degustacion de los huespedes. Ideal para ir con la familia, todo muy bien y acogedor. Volveremos!!! We enjoyed our stay very much! The appartment was very clean! We had a warm welcome by Albino and his family. Balibinos huis staat in het midden van de olijfhaarden,met een heel mooi uitzicht op het wit dorp Luque, het is ideaal voor mensen die houden van rust in een heel mooie omgeving. 10 minuten van een grote carrefour en lidl. Balbino en zijn vrouw zijn heel vriendelijke mensen en zeer gastvrij. Wij zijn zeker van plan om er terug te komen. Balbino gaf ons een geschenk, een flesje uit zijn olijboomhaard. GEOGRAPHICAL CENTER OF COMMUNICATED WELL ANDALUCIA.MUY. A VERY SUNNY PLACE, YOU PRAISE SOL'S PUTTINGS, VERY CALMLY FOR DISFRUTAT OF THE NATURE. IDEAL FOR OBSERBAR THE ROUTE GALASTICA. Andalusian people(village). Luque visits 1 kms landscape people(village). Visit the factories of Zuheros's cheese. There visits Priego of Cordova, Goat, and rest of peoples(villages) of the SubAndalusian one. tarifas decrecientes en función de la duración, tarifa en función del número de personas, arras/deposito de reserva, entrega de llaves realizada por propietario ausente durante la estanciaietario Abono del 25% al hacer la reserva y el resto a la llegada.